Common Horse Ailments – What It Is? The first sign of a cold might be a yellow or white discharge from the horse’s snout, a raised temperature and swollen throat glands. It’s a viral infection that can be spread amongst horses just as it can in humans. Badly ventilated stables, transport and appearances at shows where there is contact with other horses can all cause the spread of colds. Ensure your horse is kept warm, isolated from any other horses in your care and placed somewhere well-ventilated. Avoid sharing water troughs between horses during this time. A horse can contract mud fever by riding through wet and muddy conditions. 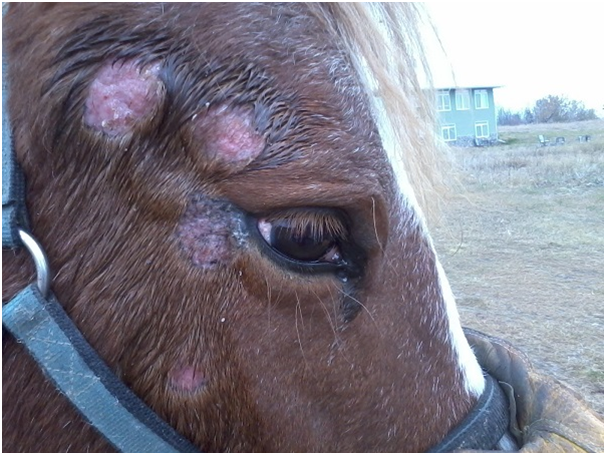 The stomach and leg skin become inflamed and becomes scaly with the horse possibly developing a high fever. Bacteria from the water enters the wet skin and traps in the infection under the scabs that develop. When you’ve been out with your horse, it’s important to clean their legs and properly dry them off to prevent any possible contamination from the muddy water. Ringworm is a highly contagious fungal infection so a horse with the condition must be isolated until treated. It can spread through direct and indirect contact so a deep clean of the horse’s living area will be needed. Signs of the infection include raised hair tufts that fall away to reveal weeping sores in a circular shape. The sores are often seen on the neck, saddle area, head and girth. All equipment will need to be treated with a fungicidal disinfectant and previous bedding destroyed. This is abdominal pain caused by anything from mild indigestion to a more serious twist in the gut. Veterinary expertise is always advised in signs of colic to establish the cause. Indications that your horse has abdominal pain can include: trying to roll, restlessness and pawing at the ground. Sweating excessively or struggling to breathe, trying to kick at its stomach or extreme irritability are further warning signs. Having a higher than normal pulse rate, trying to pass dung with no success or a raised temperature can also indicate problems with the abdominal region.